You can find the W8IZ-R repeater in a number of ways. First, it is on 444.0125/449.0125 if you are very local to North Olmsted, Ohio. The coverage is limited. The purpose for the repeater is to allow me to have access to the world from my house and work. You can find W8IZ-R on Echolink (www.echolink.org) under the "repeater" tab. You must be a licensed amateur radio operator to use Echolink but I would highly recommend the effort. You can also find W8IZ-R by going to the PUBSAFTY conference on Echolink. I maintain that conference. You can read about it here. The repeater is a Hamtronics REP-200. I've built many repeaters over the years. This time I used equipment pre-built by Hamtronics. It is a fine piece of equipment out of the box and is a fine piece of equipment now. Well done Hamtronics! The output is about 9 watts. The duplexer is a Tx-Rx which is another fine piece of equipment. The antenna is a discone that is side-mounted on my tower. It is up about 45 feet. The Echolink interface is a VA3TO VoIP (voice over IP) Multimode Linking Interface. The purpose of this box is to take the audio coming from a radio and interface it to a computer sound card. The audio from the computer is then interfaced back to the radio. Control signals to determine which end is talking is handled through a serial port connection. Interfacing a Hamtronics repeater to a VA3TO interface is not difficult. 1. Audio into the VA3TO from the repeater comes from the speaker terminal on the repeater. 2. The COR from the repeater was picked up at pin 1 of U7. 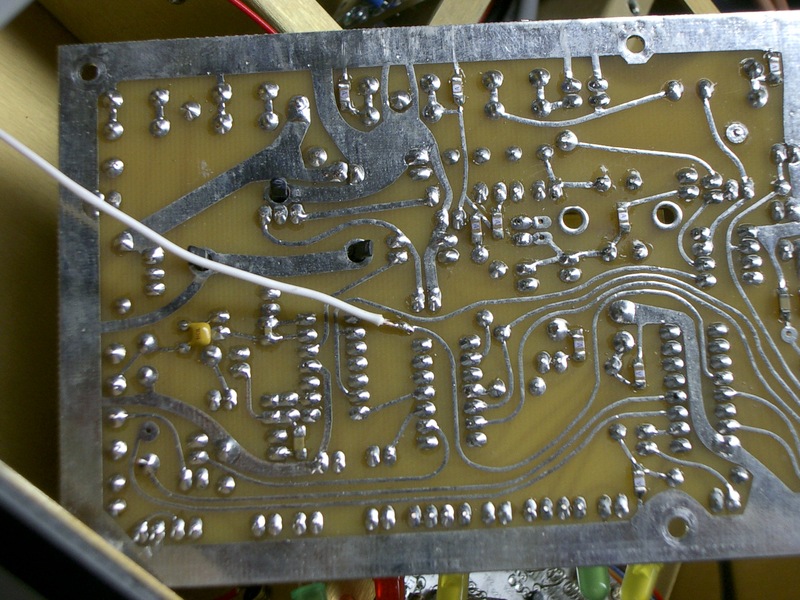 I soldered a small wire to the trace on the back of the board. 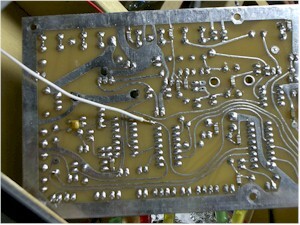 The Hamtronics COR-5 board is shown in the picture. Click on the picture for a larger image. 3. The PTT line goes to the auxiliary receiver COR at J5. 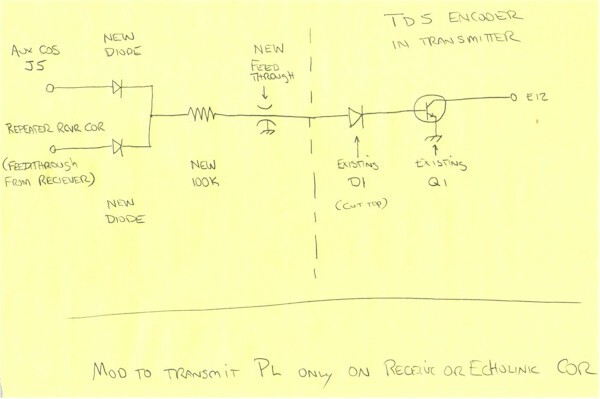 To cleanly link repeaters, you need to change the repeater so that you are only transmitting a PL/CTS tone when the COR from the receiver or from Echolink is active. My repeater has a Hamtronics TD-5 Encoder/Decoder preinstalled. I toggle the PL by causing pin 17 to go to ground when PL is needed. To do this, I turn it on and off using a transistor switch. Since the D1/Q1 switch already on the board was of no use, I cut it out of the circuit and put it to a better use. I cut the top of the lead to D1 and ran it instead to a new feed through filter. I cut the jumper between E10 and E12. I connected pad E6 to pad E12. Now the encoder will send PL when I put a voltage on to the wire to D1. Outside of the transmitter case, I took a 100k resistor to two diodes. 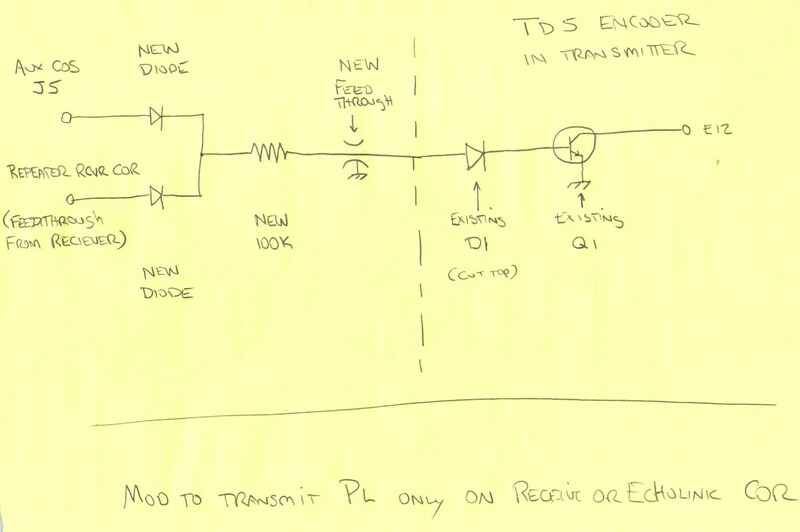 One diode is connected to the auxilary COS at jack point J5. The other goes to feed through filter coming out of the receiver compartment that hosts the repeater receiver COR (mine had a purple wire attached to it). Viola, when the Echolink or the receiver sees a signal, PL is turned on. Otherwise it is off. If you would rather, you could investigate the output of the receive decoder and use that line rather than the COR. Then the link would occur only when the receive station had PL. A drawing of the additions is shown below. Click on the drawing for a larger image.